On Sunday morning two staff members from our Bangalore support team presented themselves at the Royal Orchid (our hotel) ready to take us on a day trip. We presented ourselves in the hotel lobby freshly showered and in the same crusty clothes we’d just spent the last 18 hours traveling in. Nothing quite like putting those back on, let me tell you. But I was very glad to realize that I’d packed my camera in my carry-on when Harish (whom I’d met before in the States on his first trip over) and Dikshit (an unfortunate name the 7th grader that still lurks inside of me just won’t let go) told us where we’d be going that day. 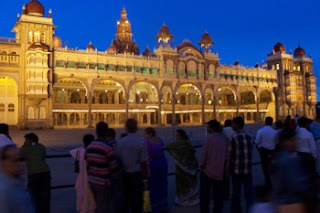 Mysore (prounounced exactly like it is spelled) is a district two hours southwest of Bangalore and home to the royals and royal palace. 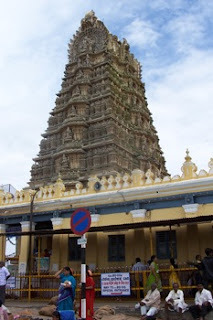 There is also a large Hindu temple there that’d we would visit. Were we game? You bet. It seems that the company has provided us a driver for the week too which, I soon found out, is a very good idea. 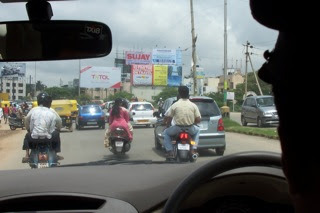 First of all…driving around in Bangalore is terrifying. There are absolutely no rules whatsoever. None. Zero. Everyone goes at breakneck speed, there are 10 motorcycles to every car (because of the congestion, people buy bikes) and double the “ricks” as they call them for rickshaws. Very few lines exist on the roads. I’ve yet to see one cop. People honk madly and pass at will regardless if there is a car coming in the opposite direction. That car will just have to move. I mean that literally. Our driver ran people off the road several times. I finally got to the point that I just couldn’t look anymore. Harish and Diskshit just laugh at our expressions. “It’s the only way you can get around here,” they insist. At one point, we just missed a man who was lying in the street his leg sprawled nearly into the traffic itself. And speaking of the motorcycles, the women ride side saddle because they wear saris. They hold their children in front of them with no helmets. At one point, I saw a man driving, a woman riding side saddle, the child in between them. And we get bent out of shape because metal slinkies are back on sale. 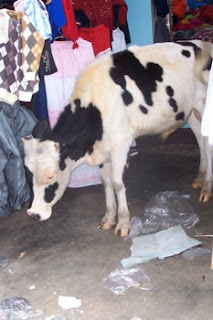 And indeed, the streets are full of wandering cows. I even saw one in a shop and the owner paid it no mind. I also asked him about the red paint on the foreheads of people in India. “What does this represent?” He told me it was also part of a religious belief. Which religion? Hindu again. What does it mean? Finally, I saw something I recognized - something I knew. A car passed us with a bumper sticker: Jesus is Love. “There are Christians here?” I asked, surprised. 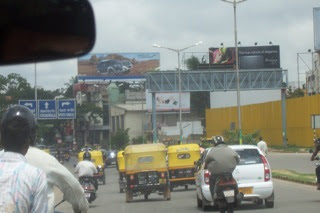 Soon enough, we were in the Mysore district. Which, to be honest, didn’t look much different to me from Bangalore. 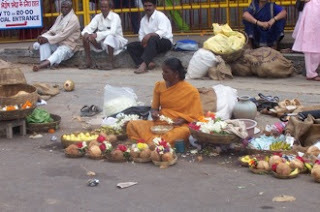 Everything about India speaks to me of crushing poverty. I kept waiting to be out of the ‘poor district’ but you never are. The temple, we are told, is a place of great importance to India and one of the larger one’s so, therefore, a great attraction. Since we are there on a Sunday, the crowds are also expected to be much larger. The driver drops us off at the base of the hill where we will have to walk to the temple and, for the first time, I feel acutely western and acutely white. We attract immediate attention and stares. There is a statue of a demon God that people are milling around and two young boys immediately rush up to us and begin their sales pitch. They are selling postcards and identify us for what we are: American and money. I shake my head and say no thank you but they persist. They follow us all the way up the hill, jabbering the entire way for us to buy their cards. Finally, at the top of the hill, he shouts in frustration, “George Bush is a bad man!” and leaves us alone. This almost makes me laugh because, after all, I do not disagree with that sentiment. At the top of the hill, the temple itself is a site to behold. 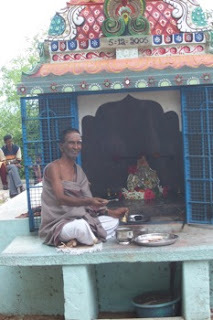 We are told that we will have to remove our shoes and socks and enter the temple barefoot. I am skeptical about this. There are a whole lot of people here and a whole of dirt. But I don’t want to miss the experience so I comply. Dikshit tells us we will not have to stand in the long line because his grandfather “knows someone”. I’m not sure how I feel about this. How will these Indians feel about these westerners bypassing the line to go into their holy place? But the Indians, polite as I’m realizing they always are, smile and nod and let us pass. Unfortunately, I could not take pictures inside the temple as it was not allowed but it was very pretty and very different. 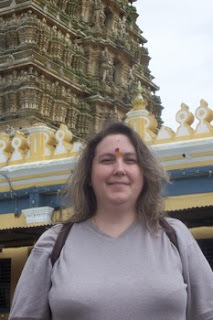 I do have a shot of me standing outside the temple after I received the priest’s blessing. And no Mom, I’m not converting to Hinduism, but I did receive the blessing so as not to offend. Finally, to end our day, we went back to where the royals lived in their palace. This is the only wealth I have seen so far to this country other than the hotel that I, myself, am staying in. Not even the worst ghettos of NYC and DC, that until now I thought were pretty bad, compare to the poverty here. The three overwhelming smells here are curry, jasmine, and dirt. Literally. When walking the streets while we waited for the “Palace show” where they turn on the lights to the palace, I had to carefully watch where I was going as, often as not, there are not sidewalks or I’d walk into a car, cow, or mongrel dog. And this is a city. Shanty huts and tents abound and begging is out of control. If you give a rupee to one, you are instantly swarmed and because you are white, they come for you anyway. There was one child, five years old, bone thin who looked at us, held up his hands and was so instantly crying when he saw us (with no mother in sight) I had to wonder if it was an act. Nevertheless, it was a good one that won him 10 rupees. People in the US often complain about taxes and I’m one of them. Having seen this however, I’m reminded just where that tax money goes and should go. Thank God I was born in the US where we have roads with lines, sidewalks, healthcare (such as it is), police and fire stations, and food and drugs are regulated by agencies to protect us. Where I don’t have to wonder if things have been checked out first and I know they are safe because, yes, the government has ensured that. India is a growing country. But it has a long way to go. At 4:30 a.m., a light tapping came at my door. "Ma'am, your bags have arrived." Came a soft voice. "Oh, thank God." I say. I let him in and thank him profusely as he cuts the wrapping they have tightly wound it with. He is there and gone within 60 seconds after thanking me profusely. I sleepily go back to bed. It only occurs to me the next morning why he was so happy. I tipped him an American dollar. The last one I had left because it was in easy reach on the desk. The equivalent of 40 Rupees when the standard tip is 10. Oh, well. I have my clothes back now and all is well.